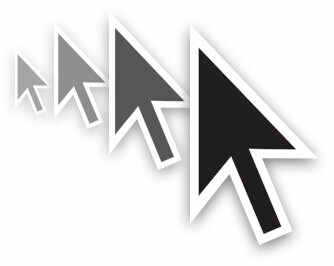 One of the new feature additions in newer Mac OS releases is the ability to quickly locate a mouse cursor on screen by shaking the mouse or trackpad cursor around, which causes the cursor to enlarge briefly, making it very easy to find on single or multiple display setups. This is a useful feature particularly if you find yourself losing the cursor from time to time, but some users may not appreciate the cursor growing anytime the mouse or trackpad is shaken around or moved quickly. 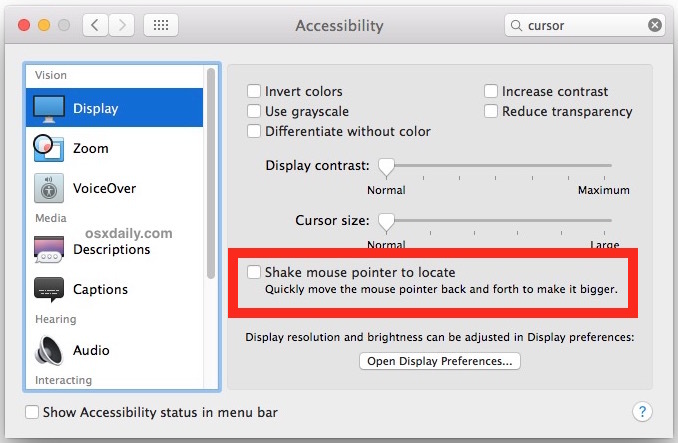 Thus, some Mac users may wish to disable the shake to find cursor feature in Mac OS X. The adjustment is immediate, if you have the feature turned off, shaking the cursor around all you want does not make the pointer larger, it’s exactly the same as it was in all prior releases of Mac OS and Mac OS X. Of course, if you turn it back on, a quick shake makes the cursor bigger again. If you have gone looking for this preference toggle before and not found it, it’s likely because the location of this setting is a little out of place, residing within Display, despite there being are multiple settings locations for Mouse and Trackpad. Perhaps that will change in a future update, but for now this is where the shake-to-locate cursor feature is found. While you’re in there, you can also choose to increase the size of the cursor without having to shake it, disable general transparency effects, or increase UI contrast if those appeal to you. Personally I like this feature and leave it enabled, but I’ve seen some users who are less than happy with the growing cursor, often with those who frequently draw or game on the Mac. I like this feature, I prefer it to CatchMouse. I like the feature a lot too, I keep it enabled as it definitely helps to locate the pointer on a two-screen setup. The complaints were inevitable just because it’s Apple. If Apple started issuing $1 Apple Store credits every time a user moved their mouse, angry mobs on the Internet would complain about it. At this point, I disabled it only because it activates when playing full screen Source based games like Team Fortress 2. If you’re twitching around and waggle your mouse a bit too much – your cross-hair is overcome with a growing mystery pointer. Yeah, same here, ive been looking for this for a while. I play TF2 and I was having the problem where it magically appeared when i moved my mouse too fast. I like this feature. But I find it’s WAAAAY too hard to get it to activate. They need a sensitivity control. Thank you. Now I can play games on my computer in class without my teacher catching me.